The holidays are upon us and unhealthy food temptations are everywhere. So, I would like to share a few reminders and quick tips about how we can stay happy and healthy this holiday season. Holiday parties and family get-togethers are so important but if we’re not careful they can be very hard on us health-wise. This season does also present many opportunities to have delicious and healthy meals and share with family members these wonderful foods with health promoting properties. Eat Plant-based – you know that feeling when you are too full and need a nap? There is a reason for that, it’s your body trying to process all the high calorie, rich foods, most of which are artery clogging, potentially disease-causing and generally very hard on our bodies. I know that since I went plant-based, I no longer have the sluggish feeling after eating big meals. Take fruits and healthy snacks to potlucks and gatherings – see the fun fruit grinches in the picture above, I found this idea on Pinterest. 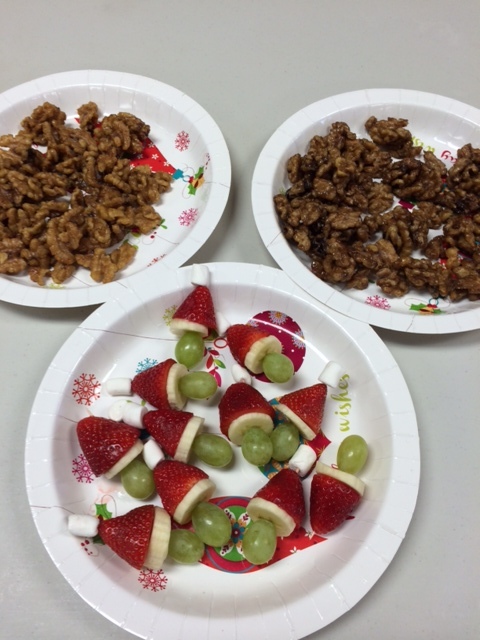 These fun snacks were skewered onto toothpicks and loaded with grapes, bananas, strawberries and topped with vegan marshmallow, very yummy! I also made some Sweet and Spicy Walnuts and will post this recipe next week. Bring lighter meals to dinners – items like salads are great ideas and can be so amazingly tasty. The options full of grains, veggies, legumes and fruits are endless. Eat a rainbow of colors. Try dishes out of the ordinary– push your creativity and get adventurous in the kitchen! Eat healthy foods before you go so you don’t overindulge. Eat healthy breakfasts- oatmeals and cereals that aren’t too heavy are great choices. Keep healthy snacks in your house and at the office so you aren’t tempted by the desserts calling your name in the break room or in the aisles at the store. Minimize the desserts or make healthier versions of your favorites, there are tons of great raw pies and other healthy desserts you can experiment with. Get out and exercise!! Take a hike, walk the dog, play in the snow. Focus the people you love and are spending time with and not your electronics or phone. Socializing has some great health benefits and the holidays are such a great time to catch up with people you care about. Have fun! Wear your ugliest sweater or play the most fun game you have. Please check out OneGreenPlanet for some great vegan recipe inspiration. 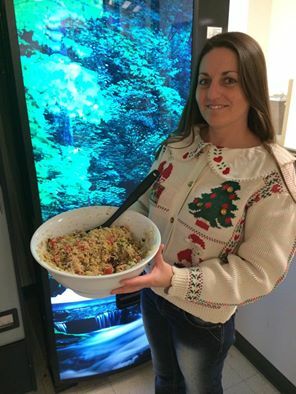 This entry was tagged christmas, health, healthy eating, healthy foods, healthy snacks, Plant based, vegan. Bookmark the permalink.